The mating flies were like a blizzard and dropping to the water as wind driven snow. Like children attempting to catch snow flakes on their tongues, the trout were shattering the surface in an attempt to feast on as many of these dainty morsels as possible. The angler, standing in the midst of this blizzard, was barely discernable amidst the millions of fluttering wings and cascading bodies. Later he would discover his waders were covered with thousands of sticky egg masses left by the mating horde. The flies were so thick on the water that it was difficult for him to see his own, but the fish were so eager to fill their stomachs that they hooked themselves as they engulfed his artificial. When the onslaught was over he waded from the river, and sat down on the bank thoroughly satiated, and suffused with a weariness that comes from having experienced total exhilaration. A few stragglers danced over the water but the trout, completely stuffed from the previous abundance, ignored their presence. What insect was this that caused such reckless intemperance, such wild abandon among creatures that are normally associated with selectivity and shyness? Perhaps a hatch of mayflies, those darlings of fly fishing literature, or perchance an egg laying flight of bumbling salmon flies intent upon throwing themselves into the maws of the waiting trout? Most experienced anglers would recognize this scenario as the description of an egg laying flight of the caddis. These moth-like insects are common on trout streams across the country during the spring and summer months, and generally occur with greater regularity and consistency than mayflies or stoneflies. Only midges are more common on most trout waters than caddis. In addition to consistency and regularity they generally occur in sufficient numbers to attract the attention of the resident trout population. 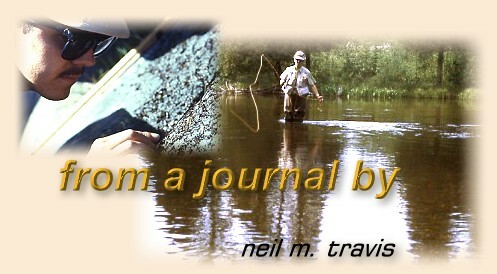 My favorite type of fly-fishing for trout is with small dry flies, and I really relish the opportunity to fish with small flies to big fish. The ultimate for me is to find large trout selectively feeding on small mayfly spinners, especially just after sunset on a warm summer evening. Unfortunately I only get this opportunity on rare occasions since a wide variety of factors must all come together to engender such an occurrence, however on many occasions the evening has been rescued by a egg laying flight of caddis. In the fading light of day caddis have saved the evening on more than once when the hoped for spinners never appeared, or were blown back into the bushes by a late afternoon zephyr. One such evening occurred many years ago on the Henry's Fork at Last Chance, Idaho. It was mid-July, and heavy hatches of pale morning duns had been occurring for several days, but each evening thundershowers had drowned the spinner flight before the flies could get to the water. Each evening I had sat in my vehicle hoping the rain and wind would cease in time for the spinners to resume their activity, but for several nights in a row the rain and wind lasted long enough to remove any opportunity for the spinners to fly. By the time the last shower had drifted over the mountains towards West Yellowstone darkness had descended, and any hope of fishing the PMD spinners was lost for another evening. Hope springs eternal in the breast of an angler, and each night I would pray that the showers would not appear, the wind would not blow, and the temperature would not plunge after the sunset. If all these conditions would come together the spinners would be able to complete their activity before it got dark, and I would experience some superb angling opportunities. Finally the conditions all came together. A warm sunny day was followed by a cloudless afternoon, the wind remained calm, and the temperature was mild. I had all the ingredients necessary, but no spinners appeared. As the sun edged toward the mountains I searched the sky in vain for the appearance of a cloud of mating mayflies, but my watchfulness was to no avail. Just as the sun began to touch the tops of the peaks a few caddis began to flutter across the surface of the water, and as the sun began to disappear, and the long summer twilight began to deepen, the number of caddis continued to increase until soon the air above the water was buzzing with the frantic insects. All thoughts of mayfly spinners quickly left my mind as the first egg laying caddis began to fall to the water and trout began to respond with eagerness. Under normal summer conditions the Henry's Fork at Last Chance has a good head of water during the summer months as water is released from Island Park Reservoir to supply water for irrigation to downstream ranchers and farmers. Along the banks the flow is deep enough to encourage the trout to move into this zone, especially during the morning and evening hours, and surprisingly large trout can be found in just a few inches of water. Such were the conditions on this evening as the trout lined up along the banks to feed on the caddis bounty. In the long hour before complete darkness I caught and released more large trout on the Henry's Fork than I had ever caught on one occasion on that river. The normally selective rainbows were like hatchery trout feeding on pellets. What made the experience even more rewarding was the fact that besides of my angling companion the river was devoid of other anglers. Everyone had left earlier when the spinner flight failed to materialize. Over the years I have experienced this type of angling on many occasions. 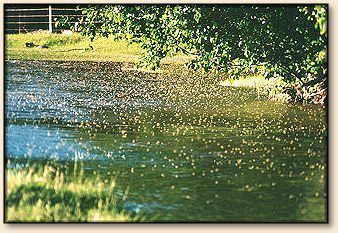 Caddis hatches are generally more numerous, of longer duration, and of greater intensity than most any other trout stream insect except midges. On the Yellowstone the caddis flies have become the premier insect species during the summer months starting with the 'Mother's Day' caddis in late April, and continuing with several other species throughout the summer. Caddis flies are more tolerant of warm water, more resistant to pollution, and are found in most types of aquatic habitats from weed beds to silt and gravel substrates. Most caddis flies are herbivores feeding on algae and other types of vegetation, and on the Yellowstone the increase in caddis numbers might be attributed to increased enrichment caused by agricultural and residential runoff. More sterile freestone streams tend to have marginal numbers of most aquatic insects including caddis flies. Caddis flies come in a variety of sizes and colors; however the most common colors are gray, olive, black or brown. Most caddis flies on our local waters can be matched with flies tied on size #14 to #18 hooks, although an angler may occasionally encounter some larger species, and micro-caddis hatches do occur. Caddis fly imitations are easy to tie, with successful dry flies consisting of just a body, wing and hackle. Caddis flies are often mistaken for moths since their wings are moth-like, and when at rest they are folded over the back of the insect in a tent-like manner. A well-rounded angler will have a selection of caddis emergers [wet flies] that can be used to imitate the emerging and, in some cases, the egg laying forms of these insects.